Merriam Webster defines an artisan as a worker who practices a trade or handicraft or one that produces something in limited quantities often using traditional methods. As a part of a new series I will be interviewing artisans that I meet on the road. I am interested in all parts of their craft and creative process. I am interested how their art relates to their culture and how it is viewed by their society. I have a base set of questions but plan to allow the interview to flow into the place where it becomes a conversation and less so an interview. I love to hear people talk about their passion and this is another way of doing that. As luck or serendipity or unconscious planning would have it, two of my first Airbnb stays are with artists. This has become a fabulous opportunity to get this series off to a good start. 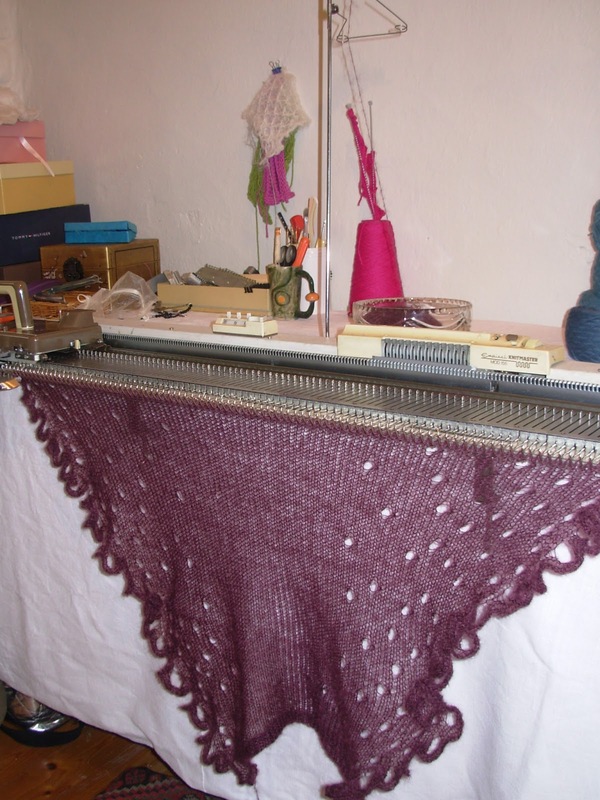 My shawl on the hand loom! First up Steph Gahan. Steph is a masterful knitter. She used to knit exclusively by hand but now uses a hand loom that she bends to her will. I saw the loom and from my perspective it is still mostly by hand. She knits under the label Saolre. Steph uses kid mohair, alpaca, and merino in her designs. They are each wonderfully soft next to the skin. I had the opportunity to ask Steph a few questions about her craft. How and when did you start your craft? I started knitting in primary school. My Mom, Grandmother and Great Grandmother were all knitters. We had a lot of art in the family. My Dad's cousin Muriel Gahan started the Irish Homespun Society in 1935 and was a founding member of the Irish Arts Council. Craft had mostly disappeared in Ireland but in the 1940s and 1950s this Council revitalized it and promoted craft. I did a lot of travel and once I returned to Clare and the land I was inspired to make new designs. I started spinning and dyeing yarn and realized that people wanted to buy it. So I sold it for a bit. The spinning, dyeing and knitting was very labor intensive. Eventually I realized that I would need to learn to work on a hand loom. 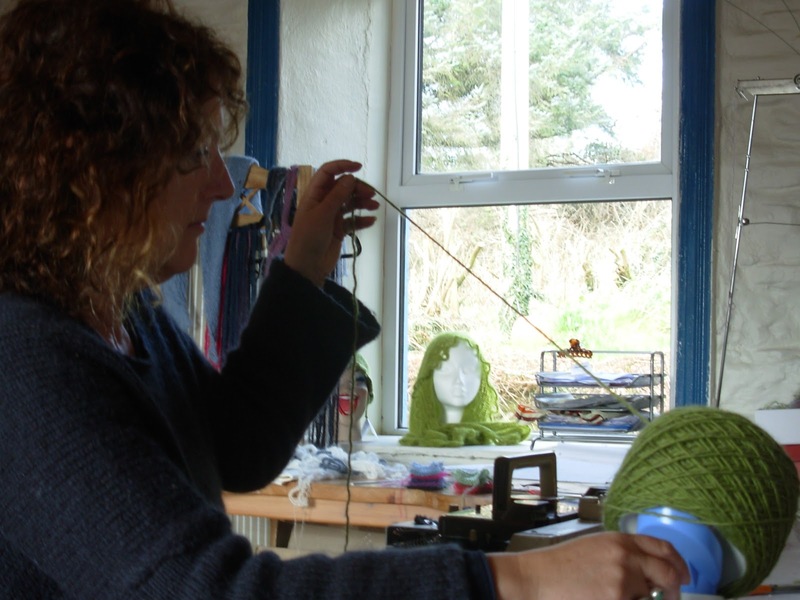 I went up to Dublin to take a course in that and started knitting using the hand loom. At first it was difficult but I eventually learned how to make it work for me and bend the way I wanted it to. In the late 80s I was knitting mostly for people in the locality. I had a wooden toy shop and also sold my knitting there. I went back to college as a mature student and did a degree in product design through the ceramics department. It wasn't just making ceramics but overall design and how it relates to your work and the market. I did a lot of ceramic sculpture but ceramics were a bit temperamental for me. You never need to heat the knitting. So as a result my knitwear became sculptural. I came back with so many ideas for new designs. How do you do it, what is your ideal work space? I had a workshop outside of the house in the nearby town but we had one really bad winter and I couldn't get into the studio to work. Now I have a studio in my house and it is much more convenient. I can always get into the studio. It was nice to have a studio with other artists in the area for an exchange of ideas but usually everyone was so focused on their work and shut in their respective studios. An outside studio is great for bringing people in, but not so great if you can't get to it. At home I can just take a walk and get inspired. My area, the house, the land around here is very inspiring but I still need the water to get inspired as well. I head to the secluded little known beaches to look at the designs of nature, photograph them and create designs from the patterns of nature. Quiet, wild beaches are always the goal destination. One of Steph's photographs she took as inspiration. Do you feel more creative or inspired by a particular time of day? The morning for sure, especially if you have a piece you are working on, an ongoing project. If you have something on, you get the momentum and don't want to get out of the flow of it. I can work on other parts of it at night, like the website or sewing on labels. But for design the concentration is much better in the morning. I was looking for an Irish name, a soft sounding one as some Irish names can be harsh. Saolre means life cycle, there are all these life cycles in nature and in life. There are times I gave up knitting and went back to it, so it is symbolic of my journey with knitting as well. It is pronounced Sail-Ray. It's a bit difficult to remember but quite symbolic. A few of Steph's wonderful designs. Shawl, dress, and arm bands all by Steph. Is craft related to your culture? Your cultural history? Art is embedded in culture, writing, music and painting in Ireland. Ceramics and other arts and crafts not so much. It was dying in Ireland and that is why my Dad's cousin brought it back. It's a great tourist attraction as well. There are even some tax free zones for artists in Ireland. It is different by county of course and each county has an arts administrator. Is it respected in the culture? Locally in Clare, music is the big thing. It has the greatest respect in this area. Some people appreciate the art but each person is different in their appreciation of different art and has something unique that appeals to them. There is some art in the schools but it's mostly limited to drawing, painting and some music. After a certain level it is no longer mandatory at school. Yes, but I do less than I used to. If I am out promoting there is no one to make it. I do craft fairs each year and usually focus on the big fair in Dublin during the Christmas season. It's called the National Craft and Design Fair. Thousands of artists set up stalls at the fair and sell for the holiday season. I show at the fairs, sell online from my website, occasionally do "pop up" shops. People in the urban areas seem to appreciate the work more or are more willing to buy it. They are upmarket pieces. I have to pick specific places to sell it locally, I can't just be at any stall. How did you develop your pricing system? I developed it over time. It's always hard for a crafts person to set prices. You have to take into account overall time, materials and create a ratio that works for you. There are also wholesale prices and retail prices. It's a pretty niche market. You do it because you love it, not because of making money. You usually have to supplement even if you are doing it full time. Would you ever train someone as an assistant to help you during the busier times? No, occasionally I would teach a class or something but not to take someone on. I like the solitary nature of it. It's the right size for me, so I don't employ anyone. The time it would take to train someone new wouldn't be worth the time lost in the creation process. I would be knitting no matter what, even if I wasn't selling anything. Yes depending on the season and how busy I am. You can contact me directly on the website for custom work. Do you have any advice for aspiring artisans, artists, crafts people? You just gotta do it! And surround yourself with other artists if you can. 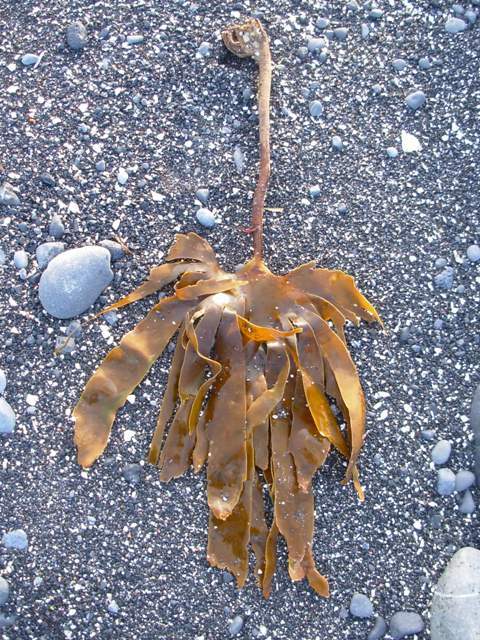 Another few of Steph's inspiration photos she took while walking on the beach. Love the light yet haloed texture of your pieces! Love the texture of your fabric; light, flowy, soft! Thank you Joan for your comments, th etexture also feels like a warm breeze on your skin.